It can be overwhelming to figure out what to eat on your first time in Osaka. Let an English-speaking guide take you and your friends on this small group street food tour. Discover new foods and flavors, and let your guide personalize the tour to your tastes. 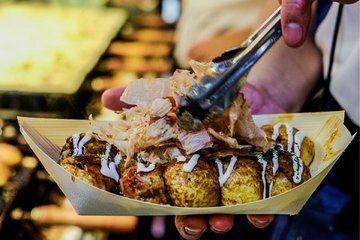 Taste foods like oden, okonomiyaki, and takoyaki, and down a few beers if you'd like, at food stalls recommended by your guide.